When you live in Canada, snow is just a part of life. There is nothing that you can do to avoid it but you can change the way that you deal with it. Instead of grumbling and wading through snow, or wiping out on ice, call a Gorilla to make winter a bit more bearable. A passable property is within reach with our Sackville snow clearing and salting. The weather in Nova Scotia is unpredictable. It can be difficult to keep track of incoming weather patterns and it can even more difficult to deal with their aftermath. Not everyone is ready to throw a shovel over their shoulder and do hard labour to get rid of snow. Annual snowfall in the Sackville area can reach upwards of four feet. That is a lot of heavy lifting to contend with! Trying to tackle this amount of snow fall, even in pieces, can lead to strains, sprains and thrown backs. Luckily, our Gorillas have the muscle and manpower to get the job done for you. Don’t try to take on Jack Frost all alone, when you can call in reinforcements for your Sackville snow clearing and salting. Snow management comes in all shapes and sizes, but not all of these are effective. If you are dealing with a larger or multi-unit property, a shovel just won’t cut it! At Gorilla Property Services, our Sackville snow clearing and salting can be made to accommodate spaces both large and small. Whether it is day or night, our Gorillas are available for 24/7 emergency call-outs. With shovels, ploughs and snowblowers at our disposal, our Gorillas can cover single-dwelling, multi-unit and large commercial properties. 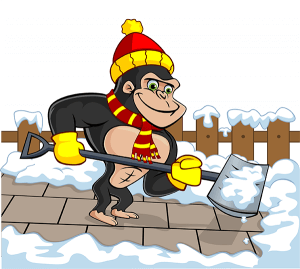 In addition to snow removal, our Gorillas help keep you on your toes with our salting services. Tossing a handful of salt down on a patch of ice is not enough to get rid of the problem. Our Gorillas know all the tricks to make icy areas manageable.